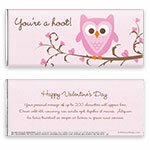 A friendly owl adorns this sweet and stylish Valentine's Day chocolate bar wrapper. 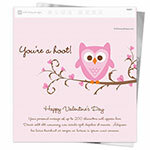 Design: Valentine owl on tree with branches and heart-shaped leaves. Personalization: Front greeting, back title and message.